Vice-presidential candidate Sandiaga Uno has promised that if elected, his government will revise the controversial 2008 Electronic Information and Transactions (ITE) Law, but political opponents and civil society activists have cast doubt on the sincerity of the pledge. On Thursday, after visiting musician and opposition activist Ahmad Dhani in prison after his conviction under the ITE Law, Sandiaga posted a video on his Instagram account with a caption promising to revise the law and remove the “elastic”, or ambiguous, clauses it contains. Hukum jangan dipakai untuk memukul lawan dan menolong kawan. Hukum itu tegak lurus, jangan tajam ke satu sisi, tumpul ke sisi yang lain. Hukum itu tidak mengenal tebang pilih. Kita ambil hikmah dari kasus @ahmaddhaniprast ini, kedepan Prabowo-Sandi akan lakukan revisi terhadap Undang-Undang ITE yang banyak mengandung pasal-pasal karet. Pasal-pasal karet itu akhirnya masuk ranah abu-abu dan sangat rentan diinterpretasikan. “The law should not be used to hit opponents and help friends,” he wrote. “We should look at the silver lining of [Dhani’s] case, going forward Prabowo-Sandi will revise the ITE Law, which contains many elastic clauses. Those elastic clauses create gray areas that are very much open to interpretation. 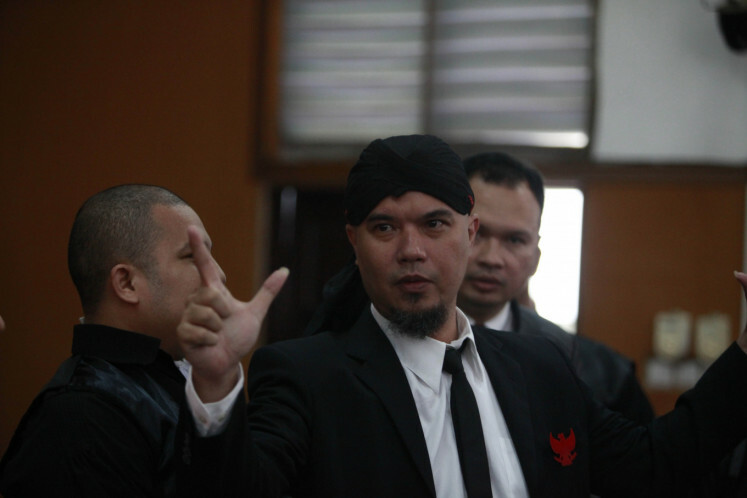 Dhani was found guilty of “spreading information that is intended to create hatred or hostility to individuals and/or groups based on ethnicity, religion, and race,” in violation of Article 28 of the law, based on three tweets he made in 2017 calling former Jakarta governor Basuki “Ahok” Tjahaja Purnama a blasphemer and insulting his supporters. Dhani, who is also running for a House of Representatives seat with the Gerindra Party, is not the first Prabowo Subianto supporter to run afoul of the ITE Law. Fellow opposition activist Ratna Sarumpaet is currently in police custody awaiting trial for violation of the same article, after falsely claiming that she had been assaulted by three unknown assailants last September. She later admitted that the bruises on her face were the result of cosmetic surgery. Previously, Buni Yani, formerly a member of Prabowo’s campaign team, had been convicted for violating Article 32 of the law, after selectively editing a video in which Ahok warned Thousand Islands regency residents about people misusing Quranic verses for political purposes. When asked if Prabowo and Sandiaga would also consider revising Article 156 of the Criminal Code on blasphemy, which many activists have also slated for being elastic, Andre demurred. President Joko “Jokowi” Widodo campaign spokesperson and NasDem Party lawmaker Irma Suryani Chaniago, however, cast doubt on the Prabowo-Sandiaga team’s motivations. She said the Jokowi government was open to criticism, but that the Prabowo team was often hypocritical. She added that the Jokowi team would be open to revising the ITE Law, or any law, as long as the revision led to a better law. 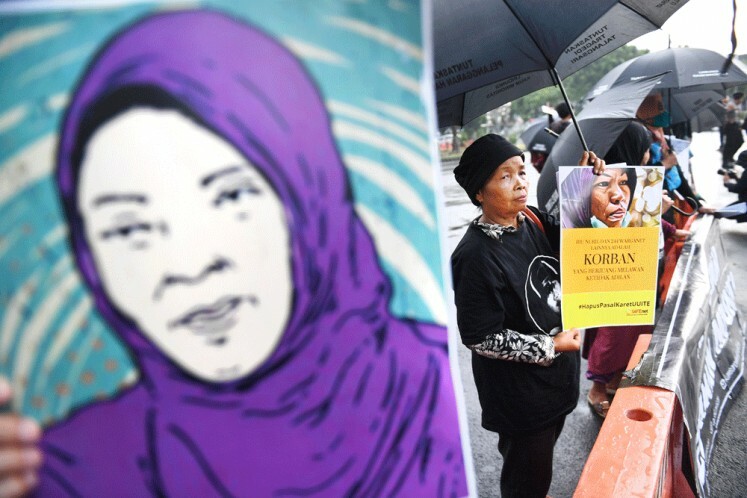 “Whoever wins the election has the responsibility to revise the law because it is a blight on Indonesia’s human rights situation,” she told the Post. She said that articles 27, 28, and 29 of the law, on defamation, hate speech and extortion, respectively, were the articles that most urgently needed alteration. Article 27 in particular accounted for 188 out of the 260 ITE Law cases in SAFEnet’s records, including the high-profile case of Baiq Nuril Maqmun, a West Nusa Tenggara woman who was convicted of defaming her alleged sexual harasser.